What Day Of The Week Is November 6? 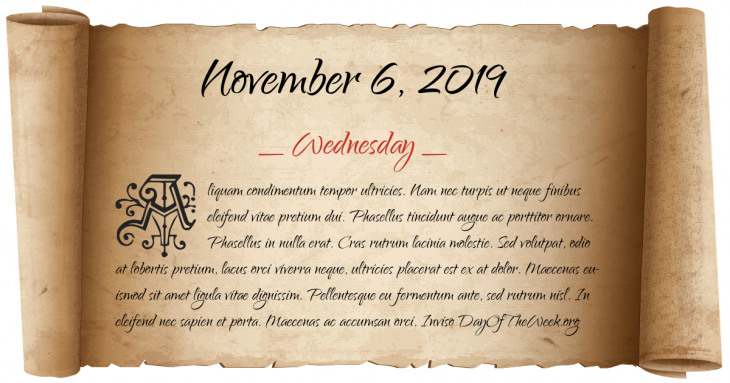 November 6, 2019 is the 310th day of the year 2019 in the Gregorian calendar. There are 55 days remaining until the end of the year. The day of the week is Wednesday. Thirty years war: Battle of Lützen is fought, the Swedes are victorious but the King of Sweden, Gustavus Adolphus dies in the battle. American Civil War: CSS Shenandoah is the last Confederate combat unit to surrender after circumnavigating the globe on a cruise on which it sank or captured 37 vessels. World War II: Carlson’s patrol during the Guadalcanal Campaign begins. Deputy commander-in-chief of the Eastern China Field Army General Su Yu launched a massive offensive toward Xuzhou, defended by seven different armies under the Suppression General Headquarter of Xuzhou Garrison, the Huaihai Campaign, the largest operational campaign of the Chinese Civil War begins. Vietnam War: Following the November 1 coup and execution of President Ngo Dinh Diem, coup leader General Duong Van Minh takes over leadership of South Vietnam. Sumburgh disaster – A British International Helicopters Boeing 234LR Chinook crashes 2.5 miles east of Sumburgh Airport killing 45 people. It is the deadliest civilian helicopter crash on record. Who were born on November 6?